Bradley Atkins serves as All-Plastics’ Engineering Director. 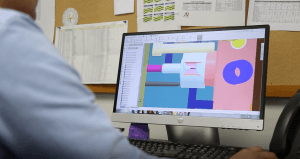 As an engineering expert, Bradley knows how critical mold design review is for the overall success of a project. Mold design review can be very intricate and time consuming to ensure all elements are reviewed and captured. To ensure everything is efficiently evaluated we have put together mold standards guidelines and have developed a worksheet within our Project Launch Workbook to evaluate each tool with. Our guidelines call out types of steels that are acceptable and how they are to be constructed. It outlines types of water lines that can be used along with acceptable requirements for locating rings, sprue bushings, water fittings, lifters and slides. It also outlines how the molds should be marked and secured for safety. All of our mold making partners have to accept and meet our stringent guidelines we have outlined in our Design and Construction Standards for Injection Molds. Our Mold Design Review worksheet built within our Project Launch Workbook is where we are verifying the intricate details like cavities, runners, ejection, radii, cores, bushings, pins, water, parting line locks and more. Once we evaluate the tool we get our customer involved for the review and acceptance of the layout and details of how the tool will be built.